I love summer with its long days, warm nights, and thunderstorms. With young kids, getting out and enjoying everything that summer has to offer isn't always possible. Both of our kiddos are in bed by 8:00 every night, and keeping them up any later does not usually end well. Sticking to our schedule and their bedtime routine makes for better sleep for them and better post-bedtime date nights for us. Since becoming parents, we have had to get creative with our nightly activities, especially if we want to make the time that we have together count. You know that we set aside time for date night once a week, sometimes we get without the kids and other times we stay home to do something after they are both in bed. I know how much of a challenge it can be to come up with things to do at home that aren't just getting takeout or making a treat and curling up on the couch to watch tv, as nice as those things are. We're working our way through a long list of summer activities after the kids are in bed, including a few house projects. I wanted to share a few of my favorite ideas with you, so below are five of the things on my list. I'd love to hear some of your favorite at-home summer activities, so feel free to share them in the comments at the end of the post. I love sitting around the campfire in the summer. You can enjoy a quick treat and talk for hours, all in the comfort of your backyard. We have a little fire pit that we can put out in our backyard, but for those of you who don't, check out this S'mores Pots tutorial. Rather than going for the traditional s'mores combination, we like to come up with some of our own. My new favorite are these "sophisticated s'mores" that we made using a variety of Keebler Cookies. I stopped by Target one day and picked up everything that we would need for this date. Right now you can get your s'mores date night necessities and save money at the same time. 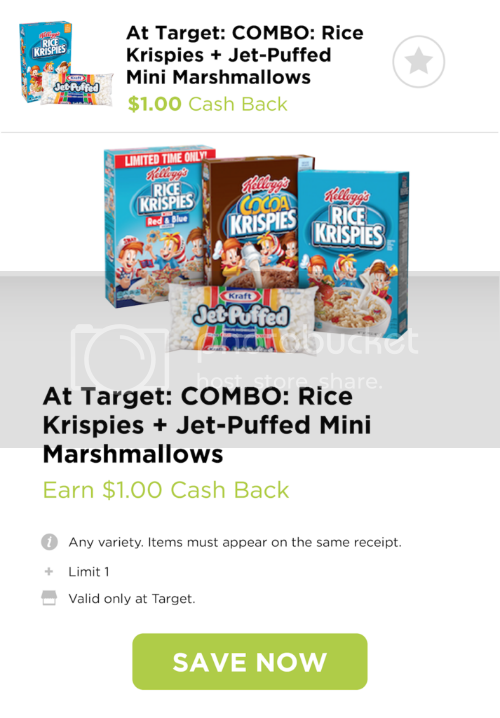 Rice Krispies Checkout 51 Offer - Get $1 when you purchase Rice Krispies Cereal and Jet-Puffed Marshmallows. Offer valid: 5/18-7/12. Keebler Cookies Cartwheel Offer - Save 10% on Keebler Cookies. Offer valid: 5/21-7/8. Click the images to the right and below to view the offers. For this date, we purchased Keebler Sandies Pecan Shortbread cookies and Keebler Sandies Toffee Shortbread cookies. We also grabbed some squares of chocolate, Jet-Puffed marshmallows, Kellogg's Rice Krispies and Kellogg's Cocoa Krispies. For a twist on the classic s'mores, we also used Keebler Deluxe Grahams cookies. Making our "sophisticated s'mores" treats was simple! Roast your s'mores until they reach your desired toastiness, then place them between two cookies, on top of a square or two of chocolate. So yummy!!! I loved all three variations of our s'mores, but I think that the Keebler Sandies Toffee Shortbread cookies were my favorite version. You could also roll your toasted marshmallow in Rice Krispies or Cocoa Krispies. If you have kids, I bet you own some sidewalk chalk. If you don't, you can purchase some for just a dollar or two. Our kids go to bed long before the sun, so we have plenty of summer light to spend time in. Take the baby monitor outside with you, so you can hear if anyone wakes up, which always happens when we're trying to do something fun. Spend an hour or two drawing a mural on the sidewalk, tracing each other's outlines and creating portraits or anything else your creative selves come up with. The other night when we put the kids to bed, the sun was going down and it was still over 80° outside, perfect for a water fight. Pick up cheap little squirt guns or heavy duty super-soakers, whichever you prefer. If you don't have squirt guns on hand, pitchers or bowls full of water can work just as well, if not better. One of my very favorite things about summer are the outdoor movies that are shown in city parks. Unfortunately, they're shown long after our kids are in bed and the movies that we can see are limited. If you have a projector that you can use to show the movie on the side of your house, that is ideal. If you don't have a projector, an outdoor movie is still doable. Bring a laptop, tablet or your phone out to the yard. Curl up in a bunch of blankets in the back of a truck or on an air mattress. Watch whatever movie the two of you are craving, then star gaze after it's over, maybe while you're listening to the soundtrack that plays through the credits. Your summer nights will look a lot different after you have kids, but you don't have to give up on having any sort of fun. Get creative and find ways to have spend quality time together, bettering your marriage relationship. What summer activities do you enjoy doing at home?